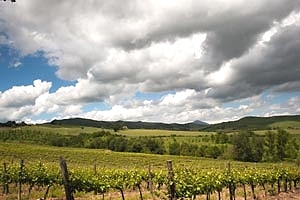 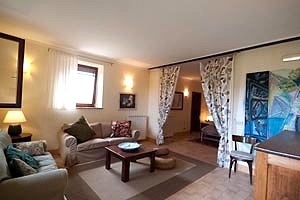 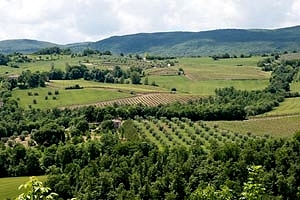 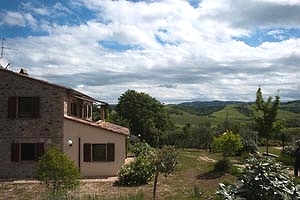 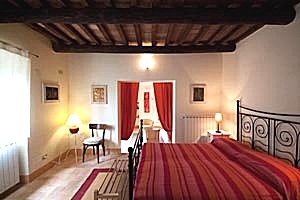 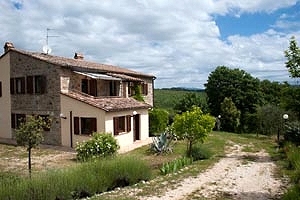 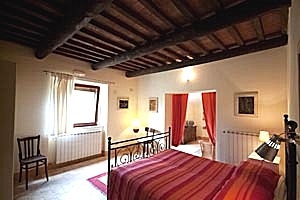 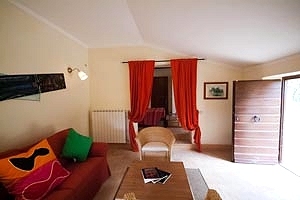 Very affordable villa near San Casciano dei Bagni, on the border between Tuscany and Umbria. 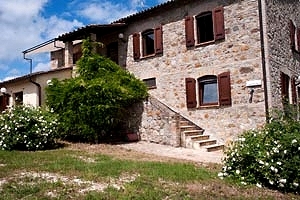 Sleeps 9, swimming pool, Internet connection, barbecue. 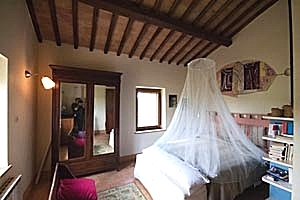 Ideal lodging for holidays in close contact with nature. 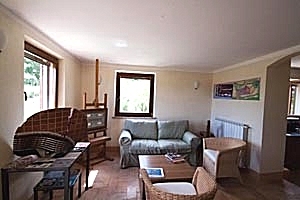 Riding stable, tennis club and thermal baths within a few kilometres. 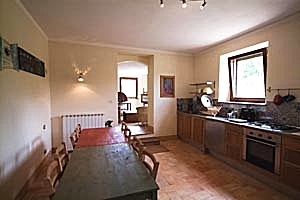 Possibility of organising cooking lessons. 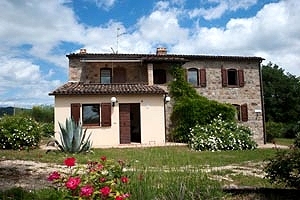 The villa stands a few kilometres from San Casciano dei Bagni (Siena) and is immersed in the luxuriant countryside of southern Valdichiana. 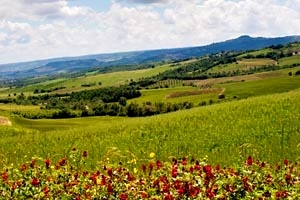 Guests can have pleasant walks and horseback or mountain-bike rides along the many trails around the property. 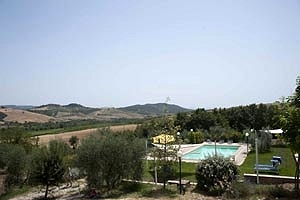 A riding stable, a tennis club and some thermal baths are within a few kilometres of the villa. 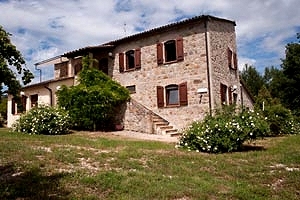 Thanks to its strategic location on the border between Tuscany and Umbria, the villa is also an excellent departure point for visiting many cities of art in central Italy, including Arezzo, Siena, Montelpulciano, Montalcino, Pienza, Cortona, Assisi, Perugia, Gubbio and Foligno. 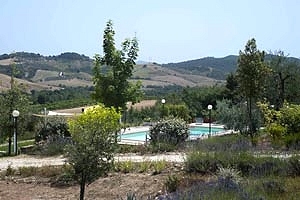 A private swimming pool (8x4 m; depth: 1-1.40 m) exclusively reserved to guests lies in the garden that surrounds the house. 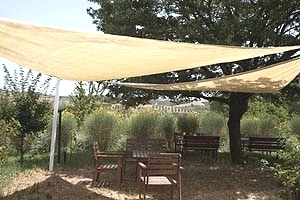 The garden is equipped with sun loungers, tables and chair for dining al fresco under wide shade sails. 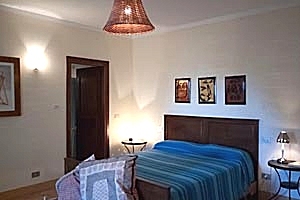 The villa is a two-storey building divided into two apartments that sleeps 9 guests in 4 double bedrooms and 1 single bedroom and has 4 bathrooms. 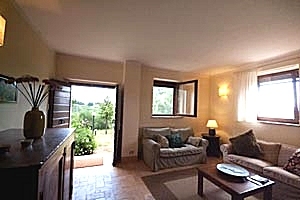 Apartment 1 on the ground floor consists of kitchen, two living rooms, dining room and two double bedrooms with private bathrooms and direct access to the garden. 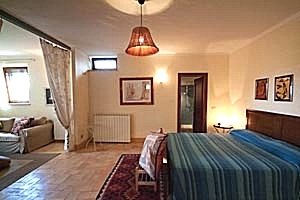 Apartment 2 on the first floor composes of kitchen, living room with fireplace, two double bedrooms with private bathroom and a single bedroom with a small balcony. 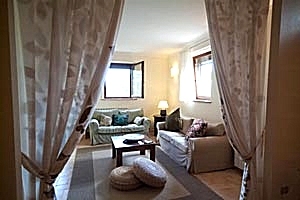 One of the living rooms on the ground floor has a direct access to the garden. 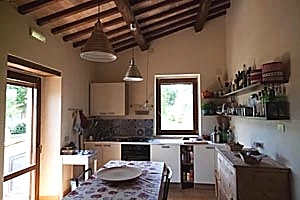 The villa is equipped with swimming pool, barbecue, fireplace, Internet connection, gas oven, fridge, dishwasher, washing machine, cot bed and private covered parking place. 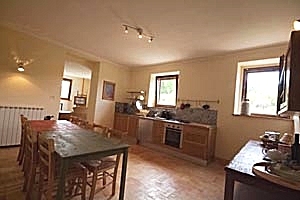 Possibility of organising cooking lessons. 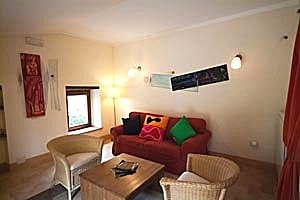 Shops and services of any kind and a tennis club are 2 kilometres from the villa. 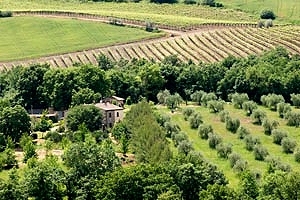 A riding stable is 1 kilometre from the property, whereas some thermal baths are within 19 kilometres. 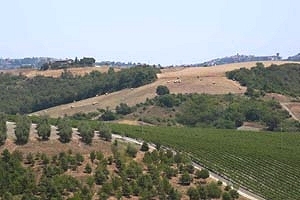 San Casciano dei Bagni 19 km - Lake Trasimeno 60 km - Pienza 61 km - Montepulciano 62 km - Montalcino 85 km - Cortona 88 km - Arezzo 102 km - Siena 117 km. 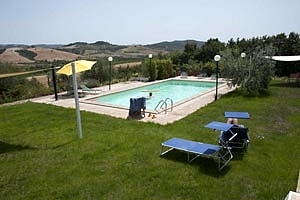 Florence airport 170 km - Pisa airport 237 km. 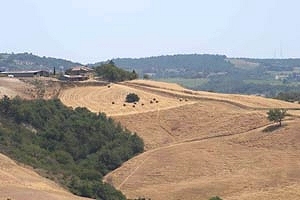 The unpaved road to the villa (1 km) is comfortably drivable with any kind of car.